United Specialty Alloys offers Blanchard Grinding services to clients as one of many options for services performed at our facility in St. Louis, Missouri. 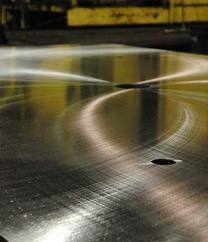 Blanchard Grinding is named for a manufacturer who pioneered the process, and United Specialty Alloys is proud to stay on the cutting edge in performing this type of process for our customers. Grinding wheels rotate counter to the part or sheet, quickly wearing down and removing unwanted stock from a part or piece on the cutting table, or magnetic chuck. A magnet helps to securely hold metals in place, while other fixtures are used to stabilize non-magnetic materials for Blanchard Grinding. Blanchard Grinding is effective for projects that require mass removal of stock from one side or portion of a part. Quick turnaround and the ability to accommodate high production orders are reasons Blanchard Grinding remains a competitive offering from United Specialty Alloys.